An insurance clerk lends his flat out to his married colleagues and their mistresses. However things get complicated when he asks the lift operator he’s always fancied on a date. Music in the movies, can often make a marvellous movie into a masterpiece. For me in the 1970s, there was the moving Francis Lai’s Sarah’s Theme in International Velvet (1978). The 1980’s it was the stirring Andrew’s theme in Misunderstood (1984). More recently, the wonderful love theme, Mia & Sebastian’s Theme (Late For The Date). This heard – and danced to – in the ending montage in the musical La La Land (2016). I’m sure you will have your own choices. But agree that there is nothing like a hauntingly emotive and beautifully composed film score to get you involved in and with a movie. All these lovely musical compositions, have me on the verge of tears (if not crying). This even on hearing them even if I’m not watching the film. Meaning on hearing that wonderful opening and recurring music written for The Apartment (1960) – written by Charles Williams and originally titled Jealous Lover – had my attention from the start. Played before Lemmon’s statistically themed prologue – crammed with facts and figures of his current place of work and his job – had even started. This musical tune, evoking the thoughts of a love and timeless romance in a sometimes dramatic way. A perfect fit for the film that it is. This Manhattan based film tells of a mild-mannered, lowly insurance worker C C Baxter otherwise known as Bud (Jack Lemmon). Or less kindly by some of his co-workers as “that schnook who works in the office”. Bud lends out his apartment to the companies executives for their latest extra-marital liaisons with those gals from the office. In exchange the executives dangle the thought of a promotion in Bud’s face by saying they’ll recommend him for advancement to the big boss, Sheldrake. Since he can’t go home whilst this regular “event” happening, Bud does extra hours at work until its “safe” to go home. On one such night, his apartment still “busy”, Bud hangs around outside his apartment. Looking like at best an inept Private Eye and at worst a shifty stalker. Bud’s neighbours – Dr. Dreyfuss (Jack Kruschen) impressed at Bud’s sexual prowess and his wife (Naomi Stevens) thinking he’s a bit of a cad – believe Bud has at least one new gal every night. Bud lets them think this way, as he’s the soul of discretion in these matters of the heart. Bud is a lonely bachelor. Once home, Bud spends the reminder of his night with a ready meal and a movie. After he goes to bed an executive calls to use his apartment in the wee small hours. Bud develops a head cold after waiting in the park for this colleague and his mistress to leave. This leaves him ill and tired the next day. Despite this he goes into work. Once at work, Bud’s madly in love with Fran Kubelik (Shirley MacLaine). the elfish looking lift operator Bud kinda flirts with Fran in a Jack Lemmon sort of way, by gittering non stop about facts and figures. Fran appreciates his genuineness and friendship – compared to their more slimy co-workers – and laughs at his easy humour. She also is fond of his gentlemanly ways, as he courteously removes his hat when in her lift. At work, Bud’s seen to keep an apartment “appointment” diary in which he shuffles times round in a bid to please everyone after a sudden booking. The feverishly ill Bud then summoned to see the head honcho at work on a higher floor. After sharing a lift with Fran, he gabbles and is superhappy when she gives him a flower for his lapel. Then he meets with his boss, Sheldrake (Fred MacMurray). After Sheldrake speaks to his wife about working late, the pair talk about Bud’s promotion prospects. Sheldrake – after some veiled heavy hints – obtains the key for Bud’s apartment, for him and his mistress. He offers Bud tickets for a show that night in exchange for the key. The lying toad. After work, Bud asks Fran on a date. She agrees to go to the show with him. However she’s frank with him. Telling him she has some unfinished business to complete with her ex-boyfriend first. Saying she was serious about him, but him less so. Later Sheldrake meets up with Fran, as its revealed he is the ex-boyfriend she talked of with Bud. With Sheldrake a married man with kids. They ended after he gave her unfulfilled promises of leaving his family. After Fran admits she still loves him, Sheldrake uses his smooth charm on her. The pair then go on to Bud’s apartment. Meanwhile Bud realises he’s been stood up. Soon after this tryst, Bud returns a recently broken compact mirror to Sheldrake. Sheldrake and Fran’s relationship is inadvertently revealed to Bud at the Christmas party. After Fran lends him that same mirror and Bud – although heartbroken – hides he knows the truth from the pair. At this party, Fran discovers – through Sheldrake’s bitter and drunken secretary and ex-lover – she is one of many female employees who Sheldrake has bedded. And to see what happens next in this Oscar winning Best Picture movie, the choice is yours.. I loved this film, which reminded me of those early days of Mad Men (2007-15) with just as many in-office politics and shenanigans. Lemmon was credible as the much put upon employee. He made Bud a likeable and sympathetic character as used by his colleagues for their own ends. With Lemmon’s ordinary man persona and presence he was easy to relate to than if a matinée idol had played him. Lemmon effortlessly showed many depths to this character from a more hopelessly romantic side to a sincere and empathetic one. Lemmon showing wonderful comic talent and timing also was a powerful and moving on-screen presence in the more dramatic scenes. In all scenes, this character appeared genuine, supportive and loving to MacLaine’s Fran. MacLaine in her cheerful, friendly role showed a more softer, innocent and vulnerable side to Fran as her role developed. MacLaine gave a wonderfully natural and honest performance. Initially Fran seemed shrewd and perceptive about her being the boss’s “bit on the side”. But your heart ached for her when she spoke about the pain that went along with it. And you felt sympathy for her character, when the more oily and unfeeling side to her on-screen lover in MacMurray’s character was revealed. With her sweet on-screen chemistry and rapport strongly evident with Lemmon from the outset, I’ll admit to rooting for the underdog Bud and Fran to get together. MacMurray was fantastically evil in this bad guy role. He portrayed his snake like character as unfeeling and cold, and uncaring to all the women in his life. This seen in his relationships with his wife, female employees and Fran. In his first scene he blatantly lies to his wife about his whereabouts for that evening saying he’ll be entertaining a colleague. This so he can meet with Fran to attempt a reconciliation. These scenes seen to full effect with MacMurray’s coolly distant performance, where his only apparent affection was shown in a scene with his children. With Sheldrake father to two boys. In his interactions with Bud, my first impressions were positive as he seemed more professional, but then bad if not worse than the other executives. He was charmingly manipulative, calculating and heartless. Initally, his character built Bud up to believe he was being promoted for his hard work. Then smoothly saying (and callously implying) in a this promotion would only happen if Bud provided the hospitality of his apartment. This called for some wonderful acting with MacMurray easily showing this character’s two faced attitude. It was a telling moment when his secretary revealed that he’d had a fling with her too. Making her outburst to Fran less damning, more a badly executed warning. The film’s sharp and astutely written script was intelligently written for all the characters. Showing this skilled acting talent in both comic and dramatic scenes. And finally some facts and figures. Out of ten Oscar nominations this film won five. Lemmon and MacLaine both had Oscar nominations for this film as Best Actor and Actress. Both sadly lost out for their Oscars, but this film however led them to new heights of fame. Later receiving Oscars in The China Syndrome (1979) and Save the Tiger (1973) for him and Terms of Endearment (1983) for her. These along with another 210 award nominations – of all kinds – between them. As for MacMurray in 1960, he won recognition of a different kind, with a Star on the Walk of Fame. And later a handful of Golden Globe nominations, before creating a buzz in his final movie, The Swarm (1978). 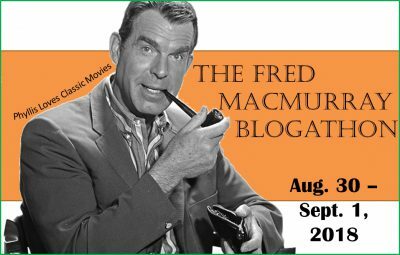 This post was added to For Phyllis Loves Classic Movies Fred MacMurray Blogathon. Other posts with this cast include Fred MacMurray in The Swarm. Shirley MacLaine in Terms of Endearment HERE and HERE. Jack Lemmon stars in Airport 77. This is a wonderful review! I used to watch this movie a lot a couple of years ago when in a strong Jack Lemmon phase. There still are a lot of things that I really like about it. Your excellent review reminded me of my favorite things about this movie, including the stirring theme. You are an excellent writer. Thanks for the lovely words and invites, had spotted both of these but booked up for lots of blogathons around this time. So sorry cant join but hope all goes well for you both. Thank you for your kind and prompt comment! We appreciate your good wishes. Good luck with all your endeavors. I do promise to enter one of your blogathons soon, just but crazily booked up this and next month. The Apartment is a wonderful film, one of my all-time favorite films, and that’s why I watch it at least once a year. A perfect showcase for three fantastic actors, Jack, Shirley and man of the hour Fred MacMurray. It was the first time I’d seen it and seems a great comedy – think would have been as interesting if they’d remade this with your Meg Ryan and Tom Hanks in the 80s, possibly with Jack Nicholson in MacMurrays role… how would you have cast it with your gals?? The release of The Apartment roughly coincided with the arrival of My Three Sons on TV, as well as the long-standing association with Disney. Fred was out having dinner when a nice middle-aged lady approached him, clearly upset. Fred got the message; he stayed with TV and Disney from then on. That’s a great wee story, thanks for sharing it! I love how this one manages to perfectly balance pain and laughter. It shows how awful people can be, but also shows how people and situations can sometimes change for the better. Love how Baxter changes as the film goes on, Jack Lemmon delivers one of his best performances in this one. I love Lemmon in this movie, he’s fantastic and its a great convincing cast. This may be the oddest movie ever made; a perfect blend of cynicism and heart-on-the-sleeve romance. How could anyone not be moved by and love Billy Wilder’s movie? Also, thank you. I shall now have that glorious theme running through my head for the rest of the day. I may start to tear up at odd times, but won’t mind at all. It is such a beautiful piece, I love it, and it and the rest of the soundtrack fits so perfectly with the movie. I just love this movie and I’m not a big dan of MacLaine or Lemmon- casual Lemmon fan? but Fred is just amazing in this movie- he’s so good at being bad- and good in his comedies! Only Wilder could bring that out in him- and I wish they would have collaborated more! Now I wanna watch this again- but ahh time- so many movies to watch not enough time! Another one of my all time favorites, Gill, beautifully done! I agree the music theme is haunting, unforgettable. I love Lemmon here, MacLaine, Edie Adams, and it is indeed one of MacMurray’s best roles…he could play a good guy or villain with equal finesse. Thanks Chris, thanks for the sweet feedback. This is such a lovely film in so many ways. and I adored the chemistry between Lemmon and MacLaine.